Budget sprayer ideal for spot or boom spraying! The EcoSpray is Quad-X’s basic model of ATV spot sprayer suitable for boom spraying. Equipped with a high-capacity pump, lockable plastic handlance and an automatic pressure cut-out switch to save battery life. It comes with 2m of handlance hose with optional extra length. The EcoSpray comes with a basic white tank and has a simple well for better chemical delivery and moulded on handles that can hold up to 15m of hose and ensure easy carrying. The Quad-X EcoSpray is ideal for both spot spraying and boom spraying. It fits on any ATV in seconds. It is available in 60L and 100L capacity. The Quad-X range of ATV sprayers run off a 12v supply and so can be used with a stand alone battery. It is possible to run the Quad-X sprayers off a ride on lawnmower, jeep/4×4 or tractor. You may need to add a suitable mounting bracket for some vehicles to attach the sprayers to. You may benefit from ordering our sprayers with the option of a 7 pin trailer plug which would allow you to simply plug the wiring into your trailer lighting socket and turn on your side ligts to power the sprayer. As standard the Quad-X ATV sprayers come with a wiring kit fitted with ring terminals to suit connection straight to a battery or for an ATV. For larger applications why not try our Tractor Sprayers manufactured by Blaney Agri Ltdour Tractor machinery division, available with 400L – 1400L capacity with optional booms widths from 8m – 12m. The low centre of gravity design gives better stability working on hilly ground. High capacity pump for boom spraying and spot spraying. Optional 60L and 100L capacity. Drain plug for easy drainage of tank contents. Easily fits onto any ATV. Runs off 12v power supply. 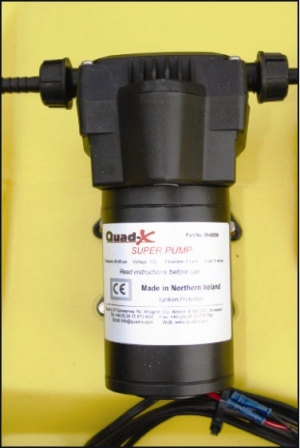 The Quad-X Superpump is fitted to the Eco, Pro, Pro Elite and Low Pro models. This pump creates more pressure for finer droplets and more accurate coverage saving you valuable chemical and preventing drift. Tanks are available in two sizes. Pumps are available in 3capacities.